The annual Durham Gala, organised by the Durham Miners’ Association was held at the Racecourse on Saturday 11th July 2015. The Big Meeting took place following the huge colourful parade of banners and bands through the city from early morning. 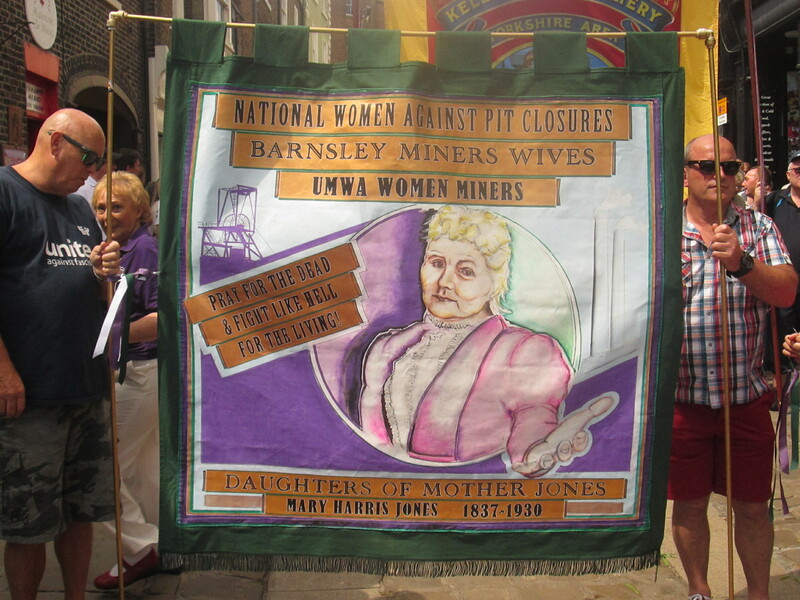 The new Daughters of Mother Jones Banner was carried proudly for the first time in the parade led by Betty Cook and Anne Scargill. Media estimates put the overall crowd at somewhere around a hundred and fifty thousand people. 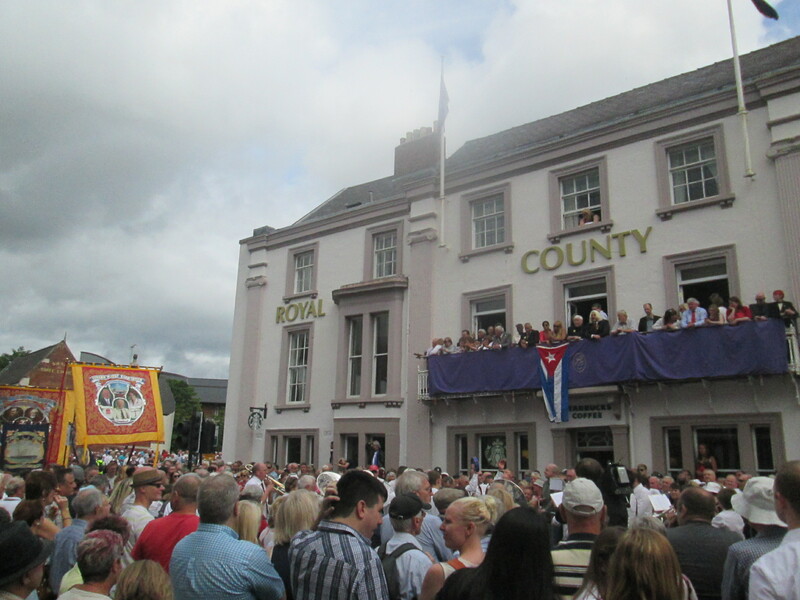 It was a triumph for the organisational abilities of Durham Miners’ Association under its General Secretary Dave Hopper, who reviewed the parade from the balcony of the County Hotel on Old Elvet. Dave Hopper in welcoming all to the Gala in a rousing speech commented “We have endured five years of austerity during which the richest people in Britain have doubled their wealth while the poorest have been driven to the brink of destitution.” Other speakers included Jeremy Corbyn MP and Owen Jones, author and journalist and trade union leaders who also addressed a packed Racecourse. All the current Labour Party leadership contenders attended the Gala. Four new banners from Sacriston, Tanfield Lea, Usworth and the Durham Miners’ Area were blessed at Durham Cathedral later in the afternoon. 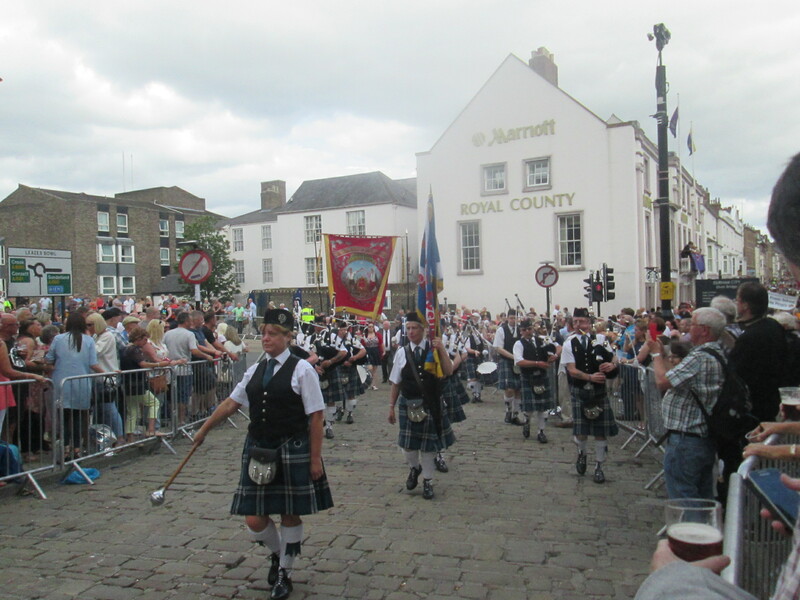 They were accompanied by bands of the Durham Miners’ Association, Hade Edge, Boarshurst and Ellinton Colliery. The Bishop of Durham,the Right Reverend Paul Butler in his sermon, referred to how the Durham Gala “demonstrates an underlying passion for justice”. Dave Hopper General Secretary of the Durham Miners’ Association will deliver the 2015 Cork Mother Jones Lecture at the Firkin Crane on Wednesday 29th July at 7.15. He will be accompanied also by actress Kaiulani Lee. Dave will introduce the classic Yvette Vanson film The Battle for Orgreave at the Maldron Hotel at 11am on Thursday 30th July. Dave was present on the 18th June 1984 and will discuss the ongoing fight for justice for the miners and the demands for a full investigation into the events of that day. Chairman of the Durham Miners Association Alan Cummings will also attend the festival.